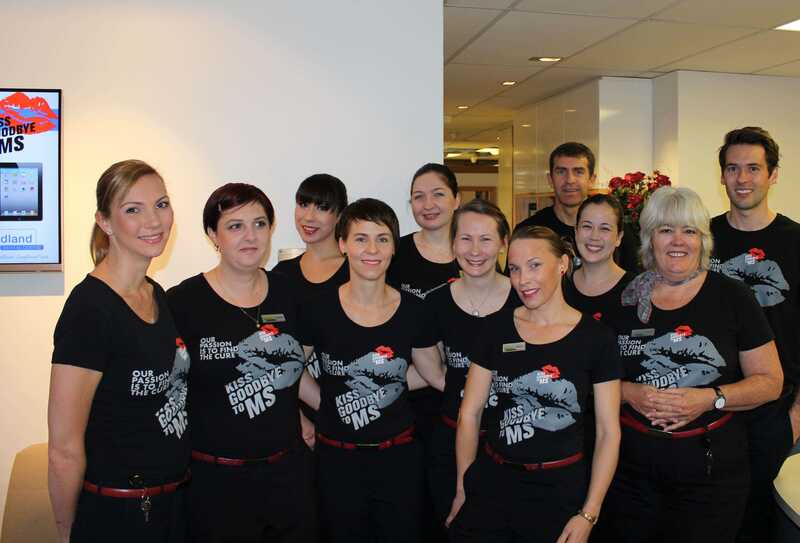 The team at Medland Dental Centre are getting ready for another big year of fundraising for the MS Society. Many of you will already know how passionately MDC campaigns in support of the MS Society, however, may not know why. Multiple Sclerosis (MS) affects young females more than any other group and MDC has been touched by this disease in many ways. Our Kelly, who most of you will know was diagnosed 6 years ago after the birth of her second daughter. It was in support of Kelly that we started campaigning so actively for MS 6 years ago. Since then, one of Kelly's sisters has been diagnosed and the sisters of three more of our staff have been diagnosed with MS. We also have a number of patients with MS in our care. It is for Kelly, and all of the people in the Medland extended family, that we support the MS Society and hope to make a difference. Our first activity for the year is coming up soon with MS Awareness Month in May and Medland Centre will be helping to "Kiss Goodbye to MS"! Again this year we will be donating $1 to the MS Society, for every patient seen in May. You will see our staff in their "Kiss Goodbye to MS" t-shirts when you come in to the practice. Check out Medland Dental's KGTMS fundraising page if you would like to view our progress or make a donation! Dr Paddison is also leading the Medland Cycling team in the MS Brissie to the Bay Bike Ride taking place on Sunday, 22 June 2014. Now in its 24th year, the Brissie to the Bay bike ride is Brisbane's largest charity bike ride with 5700 riders expected to don their lycra to support those with MS.
Last year the team of 20 staff, patients and friends raised almost $9,000! If you are interested in joining our team please contact us – the more the merrier! You can keep an eye out on the team's progress or make a donation by viewing the Medland Dental Team fundraising page. To help raise funds for the MS Society, you will see the Medland Dental team manning the BBQ at Bunnings Rocklea on Sunday, 31 August. If you are in the area please pop over to say hello and maybe partake in a yummy sausage knowing that all the funds raised will be going towards fighting MS.
Once again this year, the Medland Team will be participating in the annual Moonlight walk which will be taking place later in the year in October. Keep in eye out in our newsletters and website for other fundraising activities that Medland Dental Centre will be organising or participating in this year!